The undead have run amok in Glu Mobile's Contract Killer Zombies 2 Origins, a free-to-play third-person shooter crawling with flesh eaters. That said, you have two options. You can stand around and watch the game's hero, Evelyn, get turned into a monster snack, or you can place two thumbs firmly on the smartphone or tablet screen and come out firing. We certainly hope you choose the latter, and to give you a boost, check out this Contract Killer Zombies 2 Origins cheats and tips guide, the perfect digital companion to have while exploring Savehaven. If only Evenlyn's weapons had unlimited ammo. Unfortunately, she has to reload just like the rest of us. 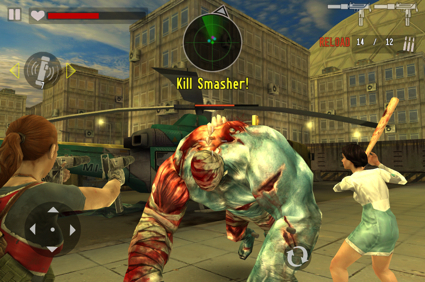 That said, it's easy to rush into the zombie horde guns blazing and die because you had a single round in the chamber. Take a moment and insert shells into that shotgun to avoid running scared from the rotted mob. Always a great idea to top off all weapons before heading into a fight. You can only use an ammo crate once per stage, aside from Survival Mode, so avoid refilling your weapons after firing just a couple of bullets. You'll quickly run out at the worst possible time. As you'll soon learn, resources are tough to come by. With this in mind, the developers scattered Bonus Crates throughout the game, and you should do whatever it takes to track these goodie-filled boxes down. Standard issue creeps go down without much of a fight, but we can't say the same for the Thrower, a disgusting zombie that chucks parasitic egg larvae at its victims, or the Bomber, filled with toxic gas. The more you know about your foes, the higher chance of survival. -Do not let the Bomber come close. Shoot him from a distance. Otherwise he will explode and deal a lot of damage. -Kill Piper as soon as possible or he will call siblings to his aid. Piper will fight back aggressively when cornered. -Move fast when Thrower begins to launch his projectiles. Be sure to attack him when he is trying to fall back and reload. -SH Security: Former security officers' armor makes them tough. These guys are hard to kill. -Zombie scientists cannot be stunned and will advance until they are killed. As you play, notice how Glu puts certain items up for sale, like 10 percent off a 10-Gauge Supershot, or 20 percent off the Streetsweeper Auto Shotgun. You'll even see discounts on Beginner and Pro bundles, which let you pick up weapons, ammo and equipment at bargain prices. This is the best way to score a lot of gear for the least amount of gold. You can't expect to beat the toughest stages with lowly Dual SMG-Micros. Fortunately, the developers will let you know which weapons and equipment you should take into certain missions. Yes, we know you won't be able to afford everything, barring some insane in-app purchase. Just keep this info in mind, and remember, this is just friendly advice from Glu. You can beat stages using a different combination of guns. Bullets will eventually become scarce unless you switch to a melee weapon. Granted, you lose the ability to pelt enemies from a distance, but come on. You know you want to slice and dice zombies with a Black Katana, or carve those suckers to pieces with a chainsaw. You'll receive free gold for nabbing in-game achievements. These range from rescuing survivors to killing 110 common zombies. To view the current list, just press the Goals tab on the top left corner of the map screen. Yes, the game has plenty of cool guns, but it also comes with a handful of items that may save your skin. You can never have enough med kits, and you'll take out more than one zombie will a well-placed grenade. Personally, we like the Damage Boost power-up, which increases damage up to three times. Low on virtual funds? No problem.